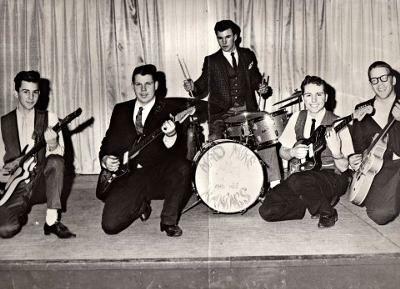 THIS IS A RARE PHOTO OF "MAD MIKE & THE MANIACS" FROM 1961. THIS GROUP PRE-DATES THE SUPERSUDS OF RHYTHM. FROM LEFT-- JIMMY LEUSCHNER, WARREN NICHOLS, BOBBY COLUMBE, SKIP JURIED, "MAD MIKE" PORCELLI. THIS LINEUP PLAYED MANY DANCES & CLUBS AROUND LONG ISLAND NY, BUT DID NOT RECORD. I remember, as a child, seeing that Fender Strat in my fathers studio in Flushing. She was a beauty! What a great photo! Thanks for sharing, Bob.